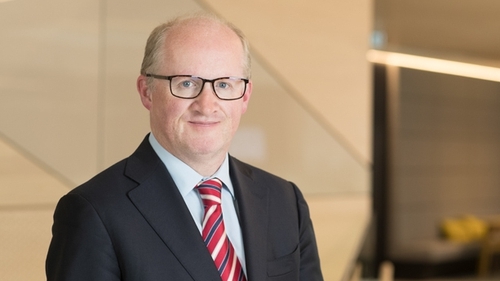 The Governor of the Central Bank, Philip Lane, is set to join the ECB executive board after getting the unanimous backing of Euro-area finance ministers. He will be formally nominated at an ECOFIN meeting tomorrow morning, while the formal appointment will take place at the next EU summit in March. Professor Lane was the only candidate for the vacancy, which arises as a result of the retirement of the ECB's chief economist Peter Praet at the end of his term. Although the nomination is to the six-person executive board, which runs the ECB's affairs on a day-to-day basis, it is widely expected Professor Lane will fill the chief economist role. A key part of that job is preparing the ECB's monetary policy decisions - the setting of the ECB's interest rates - which in turn effect market interest rates in the euro area. On his way into the Eurogroup meeting, French Finance Minster Bruno Le Maire told RTÉ News, "we are supporting Mr Lane. I really think he is the right man at the right place. I think he will be a really great Chief Economist for the ECB". At a news conference at the end of the meeting Mario Centeno, Chairman of Europgroup said: "We have unanimously agreed to endorse Philip Lane. As noted by several minsters he is an excellent choice; he is highly trained and respected. I have known Philip for several years and am very happy to endorse him." The ECB and the European Parliament will be consulted. A final decision will be taken by EU leaders, "most probably in March", he said. Pierre Moscovici, the EU Economics Commissioner said: "He is the only candidate, which shows he has a lot of capacities and if he is chosen he will be most welcome." Mr Centeno also said he expected "very wide support for Philip’s nomination because he is a highly trained and experienced economist". The decision on whether Professor Lane is appointed as Chief Economist is up to the ECB itself. Mr Lane is considered to be close to the current ECB president Mario Draghi, who also attended today’s Eurogroup meeting. Mr Draghi recruited him to chair the ECB's scientific advisory board, which presents leading edge economic thinking to the governing council, the meeting of all the Euro Area central bank governors and the six executive board members. Later he was appointed as governor of the Central Bank of Ireland, becoming himself one of the members of the Governing Council. If confirmed in the role Mr Lane would be expected to take up the full-time position in Frankfurt in June - leaving the Government with the task of replacing him as Governor of the Central Bank. Belgium, Austria, Estonia, Slovakia and Cyprus will also be finding new central bank governors this year, while the ECB is set to lose more of its executive board, with the end of terms coming later this year for Benoit Coure and Mr Draghi himself. France is keen to secure the top slot.